One of the "Made in Israel" developments presented at the Israel Defense Expo (ISDEF) is TARGET - a combat-proven mission planning software for the military, homeland security and law-enforcement agencies. With its unique image analysis capabilities and numerous mission planning tools, TARGET transforms visual and geographical data into accurate, meaningful, and actionable visual intelligence. The developers at Idan Computers state that the product was developed to satisfy the unique needs of military, homeland-security and law enforcement agencies. TARGET enables the creation of operational plans in a simple, quick and accurate fashion". 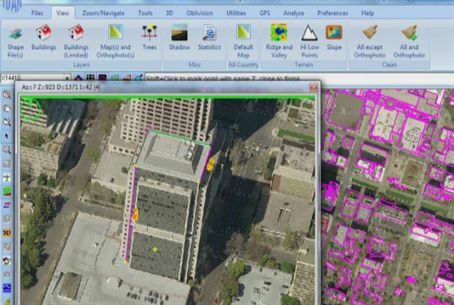 By integrating visual, topographic and above-the-ground data, users are able to create realistic 2D and 3D models of targeted areas. Then, utilizing unique image analysis tools and specifically tailored mission planning tools, operational plans can be easily devised. • Terrain analysis to create relief, slope and contour-line maps and view local and maximal high-points for basic topography analysis. Analyze terrain cross-section of digitized tracks (elevation, inclination and distances) to assess navigability/traversability. • Visibility analysis tools such as line-of-sight analysis and Sun/Moon shading analysis, all of which take into account ground topography and above-the-ground objects. • 3D modeling and visualization tools that enable simple and quick transformation of 2D models into realistic 3D models. Structures, vehicles, vegetation, contour lines, digitized tracks – all and much more can be presented in the 3D model. • Oblivision - Idan’s patent-pending image-analysis tool, combines orthophotos with oblique images to produce a 360° view of the targeted area. Oblivision unveils visual data otherwise inaccessible and greatly facilitates orientation. Oblivision™ is integrated into both 2D and 3D models. • GPS integration – a GPS and TARGET ‘bundle’ allows users to track their location on TARGET and instantly access “beyond-visibility” intelligence. Another useful feature is the ability to download digitized tracks from TARGET to GPS devices.